Once upon a time I used to enjoy drinking socially. Fast forward about 2 years and its just not really my jam anymore. Don't get me wrong, I like to let loose every once in a while, but for the most part I have become a homebody who doesn't have a fridge full of beer anymore. I will say however, sometimes its nice to sit back and enjoy an adult bevy or two. I have enjoyed the probiotic benefits of kombucha for ages, and it wasn't until recently that I tried mixing this fizzy health drink with white wine. YUM, they pair perfectly together. For those who don't know, kombucha is a fermented tea drink. It is brewed by using a SCOBY (symbiotic colony of bacteria and yeast) to ferment the sugar added to the tea in the beginning of the process. As the bacteria and yeast consume the sugar, the kombucha becomes less and less sweet and acquires more of an cider like taste. Kombucha is best known for its probiotic effect, which helps aid digestion and colonize your large intestine with beneficial bacteria. 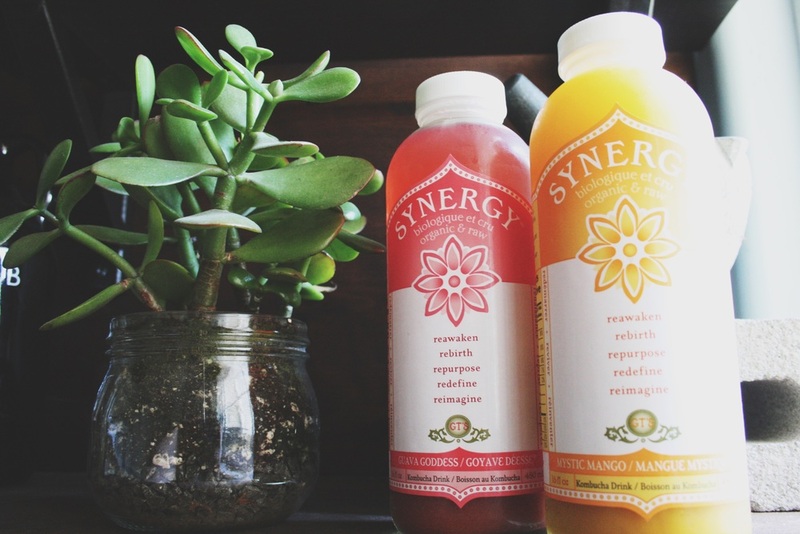 Due to its fermented nature, kombucha is also rich in B complex vitamins. These vitamins help convert our food into fuel and allow us to stay energized throughout the day. I personally love GTs Kombucha. They are widely available and come in a range of flavours. Today I used two of my favourite flavours, guava and mango to make my kombucha wine spritzers. Their ginger or berry flavour would also be delicious. Go ahead and use your own personal favourite type of white wine. I just happened to have this California Viognier left over from the last time I was in the states. It was $4.99 at Trader Joe's. I would recommend a sauvignon blanc or pinot blanc for the recipe.